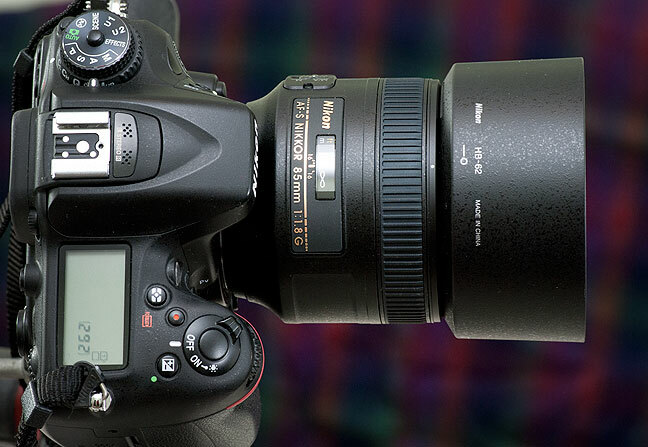 A welcome addition to my photographic tool kit is the AF-S Nikkor 85mm f/1.8G. Fit and finish on this new lens, shown here mounted on my Nikon D7100, are excellent, from the wide, smooth focusing ring to the oversized barrel of the lens, which fits my hands just right. Last year one of my favorite lenses, the AF Nikkor 85mm f/1.8, died. Its autofocus linkage was built with plastic bushings, and as they aged, the focus mechanism got increasingly stiff and rough. Both manual and auto focus were effected. Then last week, Abby and I were talking about some after-Christmas shopping, and I mentioned that we had a large number of credit card rewards points, and that I wanted to replace my dead 85mm. The 85mm to 135mm focal length range is classically thought of as “portrait length,” meaning that while these lenses do many things well, what they do best is help create portraits. You can read more of my talking points about portrait lenses here (link), and you can view some of my favorite portraits here (link). 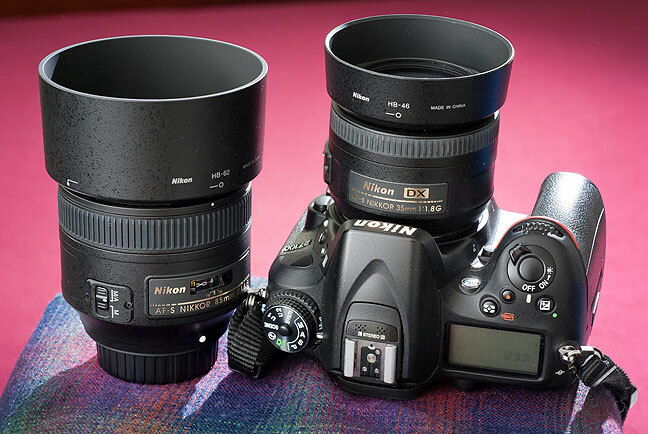 The old 85mm sits next to the new, larger 85mm. I bought the old one in 1994. The 85mm is a wonderful focal length, and f/1.8 is a wonderful maximum aperture. 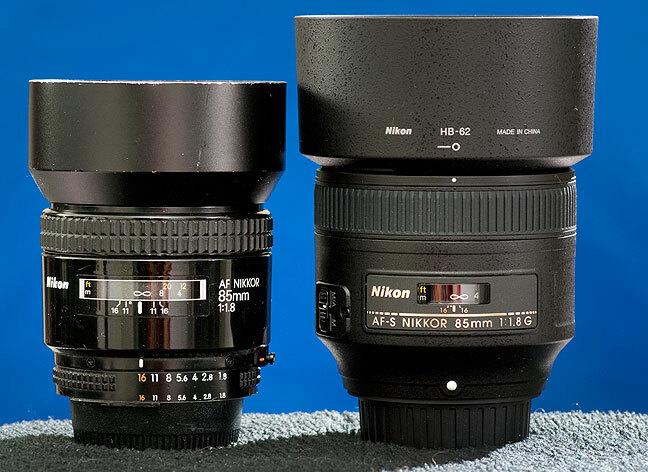 I wanted to a replacement with these qualifications, so I looked around and did a little research, and while there are some other great choices, I went with Nikon’s successor to my 85mm, the AF-S Nikkor 85mm f/1.8G. 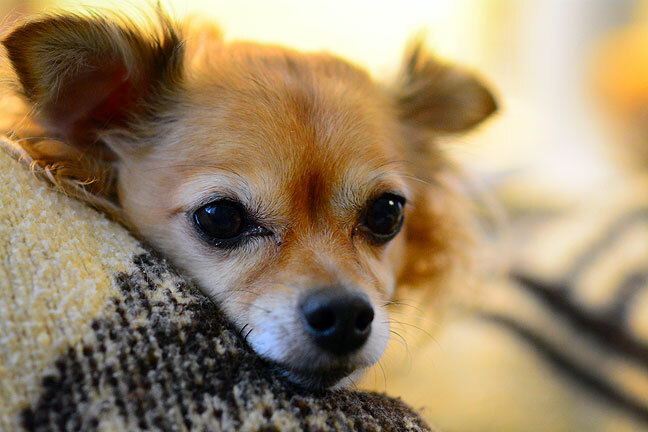 This is the first image I made with our new 85mm, of Sierra the Chihuahua in Abby’s lap. As you can see, the image is sharp, and features nice selective focus, thanks to shooting at f/2. Compared to my old 85mm, the new lens is larger but lighter, has a larger focus ring, and uses the AF-S autofocus system, meaning that the focus motor is built into the lens. It is supposedly optically different from the old 85mm, which I hope addresses some of the shortcomings of its ancestor. I took the time yesterday to make a few images around the house, and initially I was very happy with the feel, handling and performance of the lens. The results were sharp as anticipated, and the selective focus power of f/1.8 was obvious. Bokeh, the character of the out-of-focus areas, seemed pleasing. Abby and I have big plans for this lens. I expect it will become a favorite for weddings, Christmas lights and other nighttime events, particularly when combined with our excellent AF-S Nikkor 35mm f/1.8G. Of course, you can count on more in-depth reviews of this item as I expand my practical experience with it, but I can tell you that my initial impressions of it are very positive. I definitely see the new 85mm f/1.8 partnered with, among others, the excellent 35mm f/1.8, for all kinds of low light and night imaging opportunities. I am super jealous! I know you will love that lens!